How can holiday vacation be over already? Is this for real? I guess, because it's Wednesday and that means I owe you a review! Are you OK if it's from Arlington? Good, because it's all I've got. A few weeks before Christmas I hit a very hipster-chic spot, the Green Pig Bistro, with my friend Christina down in Virginia. Make no mistake, I am too old and too stodgy to eat here. Despite the almost unbearable coolness of this spot, they still served me. This place is cranking out about the highest concept pedestrian comfort food you can imagine, and serving multi-ethnic beanie-wearing millenials next to tables full of grown-up frat bros drinking brown liquor and destroying gourmet burgers and steak frites with chimichurri. We were advised by our amiable server to start with the pig tostada, and he did not steer us wrong. I initially harbored suspicions about this "snack," which rang in at $14, but no fear: it was a massive portion for any snack I would normally consume. 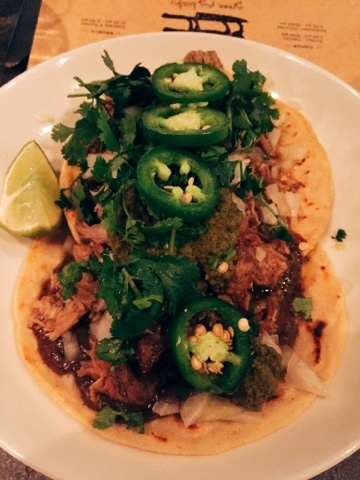 The pulled pork was well-seasoned and juicy, and lots of fresh jalapeño slices, raw white onion and cilantro on top of the crunchy corn tortilla kept things fiery and bright. A deeply flavored roasted chile sauce and a chunky, tangy salsa verde worked in tandem to keep the pork from sinking the works into too much richness. It was delicious. I really like it when things are delicious. 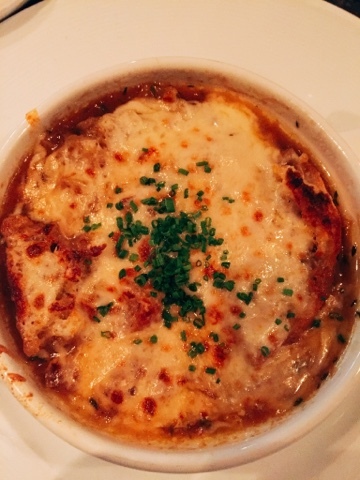 Onion soup is hard for me to deny myself. This one was good, although it was packed with almost too many sweet onions, making it hard to enjoy the deep, rich beef broth on its own merits. The crouton retained its crunch and a topping of perfectly golden brown, nutty emmentaler cheese and sprinkling of bright, fresh chives crowned it splendidly. 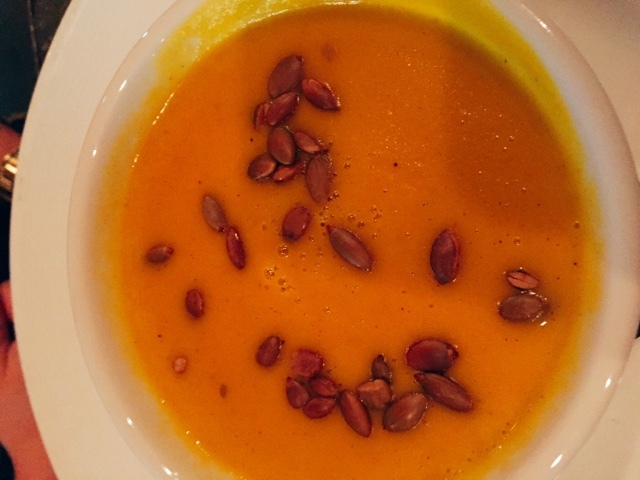 Kabocha squash soup wasn't cloying or dessert-like, as so many squash soups tend to be. It was well-enough seasoned that it balanced sweet and savory flavors with a dose of umami. That masterful flavor balance plus a gorgeously velvety texture, made this dish quite a dish. That snack, plus our soup course, was so huge, we ordered appetizers rather than mains as our entrees. 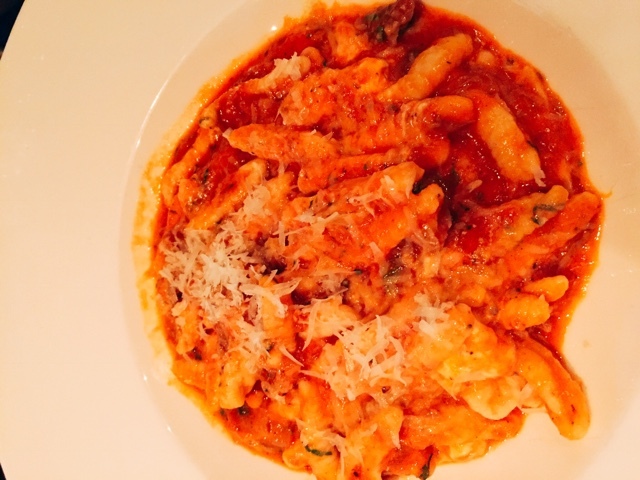 Lamb ragu + ricotta cavatelli piqued Christina's interest. Helllllo gorgeous! Oh hey, do you like rich, savory, tender meat, slow cooked tomato sauce and light, fresh cheese? Hmm, how about tender pasta cylinders? Top it all with a shower of perfectly salty parmesan cheese, and you have this bowl of goodness. 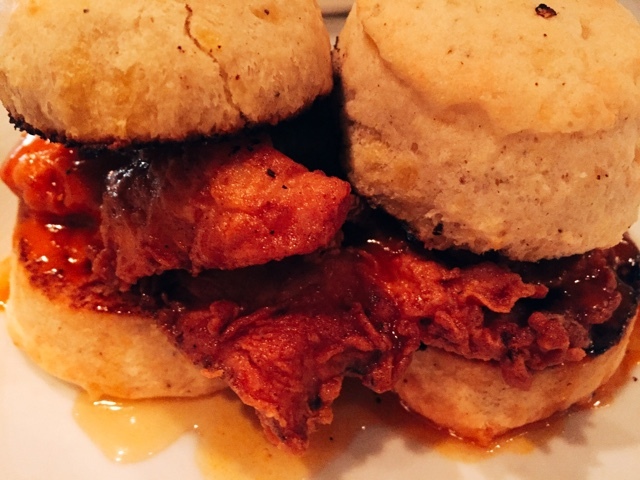 Fried chicken biscuits with spicy honey? O-Kay. I mean, I was so stuffed by this point, I could barely eat them, but that doesn't mean they weren't fantastic. Most often, boneless fried chicken has nothing in common with real, Southern buttermilk fried chicken. Once you shed the bones and skin, you tend to lose all the crunch and flavor and end up with either a flavorless puck of protein or an over-salted mess. Not so at Green Pig. These chicken patties were succulent and peppery - quite tasty paired with the sweet hot sauce. The biscuits weren't perfect - they were tender, but didn't have that pleasing slightly brown crust made by brushing the tops with butter before baking. But I'm splitting hairs here. This was good eats. I wish we could have sampled some of the main courses, but the inability to stop eating those really yummy soups kind of ruined us, hunger-wise. Dessert was simply out of the question. 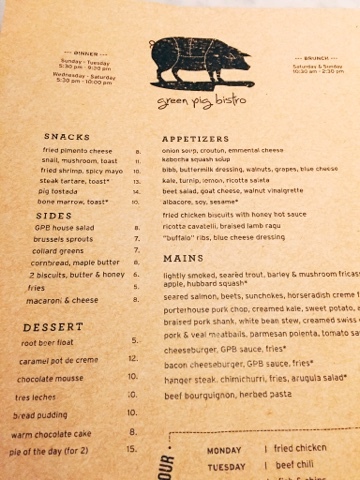 I don't think dinner at the Green Pig is going to rank in the upper echelon of restaurants you visit in the DC area, but I would definitely eat there again. It had the kind of food you want to pig out on, and everything was done well, if maybe not with the most creativity or panache of the city's premiere dining locations. I give Green Pig Bistro an eight on the BHS scale for its buzzy ambiance, gorge-worthy comfort food, and friendly service. This isn't the place for refined, new world cuisine, but you won't go hungry and you will leave satisfied. Hey, while we're here, are you following along on Facebook and Instagram with all the Big Hungry shenanigans? You'll find many more photos on IG, and on the Book, weekly meal plans, local restaurant news, and more. My hunger is big; my personality is bigger!